Home › HOW TO › Get The Look › WHICH NAIL SHAPE SUITS YOU? A well-chosen nail spice up your whole look. Do you really nice, choose a nail shape that best suits you! The most popular are collected, make it easier to find your perfect match! The choice is based to the natural line of your hands and nails, forms fit well, but at least as important to fit your style and your own way of life not disturbing you. One of the surest choice for the most feminine and really good in the hand. Optically it provides the fingers and with graceful, delicate impression. For shorter nails too flashy and functional as well as the least vulnerable form. , like the oval a good choice for almost everyone, the only difference is that it is slightly elongated, pointed shape, so it can be more modern. It looks good compared to the nail slightly longer oval. It provides more opportunities for the popular decoration, artificial nails and gel case of choice. the most popular form of French manicure, it fits well with the stark white contrast. Safety aspects have been little less recommended if you’re doing a lot of housework, because the sharp edges could cause injury. It recommended thin, elongated sleeves because optically slightly broadens. If your fingers are thicker, they’d like to do that, it should be longer. One popular form of nail optically better than the square, here you can play with the length of the nail for a perfect effect. Because of the rounded corners with a less vulnerable and more natural impression. very conservative form of nails, which provides a simple and clean look. The natural nail shape provides a very similar way, absolutely natural look. Applicable to a wider nail beds. The least vulnerable, so be sure in any life choice. For short nail bed is less showy, in this case, choose almonds or oval shape instead. the most suitable for short optical extension of the nail bed, but that’s a bit extreme recommend guy, for brave ladies. Vulnerable, as only looks good and long fingernail due to the tapered ends should pay attention to it in everyday life certainly there. Its advantage is that it makes less feminine hands Sleek and can be decorated well. 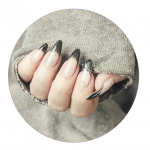 One of the latest nail trend, in form of a pointed version, except that grated on the tip of a sharp so it does not end up so little less vulnerable. The everyday is not the most practical, but if you want trendy nails, it is a winning choice! ‹ YOGA FOR THE FACE: THE EXERCISE RUST!